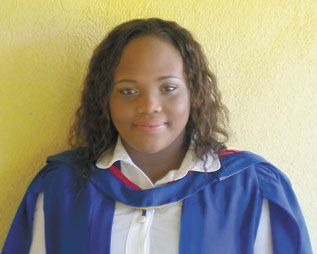 Congratulations to Miss Chagnon Glynn of Bequia on her recent achievement of a BSc. with First Class Honours in Geology (Major) and Geography (Minor). Chagnon attended the University of the West Indies, Mona in Jamaica from 2009-2012. Among her many achievements, she was awarded the Barry Floyd Prize for academic performance in Geography and was a Faculty of Science and Technology Deanâs List Awardee for her period of studies. She performed commendably and ultimately emerged as the top student in the Department of Geography and Geology, U.W. I. Her parents, Mr Hereford Glynn and Mrs Cherrylyn Glynn proudly congratulate her on her excellent performance and wish her all the best in her future endeavours.